Looking to go on a nautical adventure? Sailing away from the stress of the day is easy when you’re a member of the Hoofer Sailing Club (HSC). If you’re like me, you’ve watched sailors on Lake Mendota in awe as they tie what seem like very fancy knots and agilely adjust their sails. But, HSC instructors assure me that it can all be learned and that it’s so worth it when you do. Now a rising senior, Alise joined the club when she first arrived on campus as a University of Wisconsin-Madison freshman. As a freshman, she had little experience in sailing. Since joining the Club, she has gone from being a novice sailor to overseeing all aspects of HSC. I wanted to experience some of the things she and others learn in the Club for myself, so recently I sat down with two of the Club’s instructors, Chas Kenyon and Nora Bello, to learn an important sailing skill: knot-tying. They and other Club leaders are ready to show you the sailing ropes (literally). Chas and Nora patiently showed me a classic knot they say every sailor should know. I’m already intimidated, because the only knots I know how to tie are in my shoelaces. The bowline (pronounced bo-lin), they told me, is essential for setting sail. The knot will tighten when pulled and is used to fasten the rope that will raise and lower the sail (aka the halyard). Step 1: Start by laying the rope across your hand with the free end of the rope hanging down. Form a small loop in line in your right hand. Step 3: Wrap the line around the standing line from underneath and then back through the loop from the top. (Around the tree and back down the hole). Step 4: Tighten the knot by pulling on the line. Chas and Nora said that if I practice enough, I will likely eventually be able to tie this knot with one hand! Now that you’ve dipped a toe in the sailing water with the bowline, why not jump right into learning more about sailing with HSC? 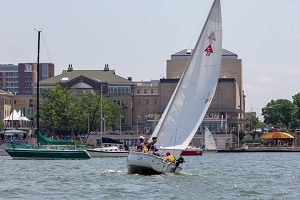 The club currently hosts the second largest fleet of inland sailboats— second only to the United States Naval Academy— and provides members (non-students and students alike) with access to sailing lessons, member-exclusive social events and more. You are welcome to learn more at hoofersailing.org.